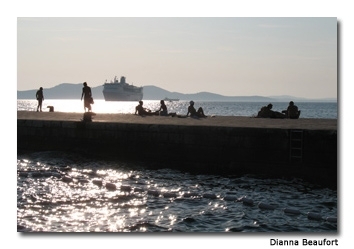 Hear the symphony of the sea on the Dalmatian coast. I had a faint expectation of seeing Dalmatians on the Dalmatian coast. It’s cliché, I know, so I dared not mention it to anyone and certainly not to the woman serving me coffee on Trg Sv.Stosije square in Zadar. She was courteous and beautiful but with her heavy make-up and teased black hair, she resembled Cruella de Vil from Disney’s “One Hundred and One Dalmatians” and appeared as though she’d moved from night into morning on just a nap. Zadar, located on the Adriatic coast of Croatia, is that kind of place. Everyone’s laid back. One might call Zadar staid and sedate if only visited in the daytime. But with thousands of students and a pleasant, cool sea breeze in the evening, the city really comes alive after 10 p.m.
“Ciao!” I hear an elderly man beckon across the market. The Italian influence is still felt in Dalmatia but especially among the older generation. From 1921 until WWII, most of the Adriatic coast was in Italian hands. “Dober vecer,” answers another, good evening, before they shake hands. “Dober vecer” was Ante’s greeting to us, too, when he collected guests for his walking tour. We joined him through the maze of Zadar’s streets. Zadar is a compact city, with its historic core spread out on a peninsula. Ante tells of WWII bombings and the reconstruction under communism. He admits it’s easy for younger Croats like him to talk about Tito since few really remember what life was like under the dictator of former Yugoslavia, which Zadar was then part of. However, they’re left with his legacy of lethargy. Tito apparently felt little affinity with Zadar and some say he erected ugly post-war buildings on purpose. To be fair, many European cities have those scars, reflecting a time when planners enforced order by wiping away history’s messiness. 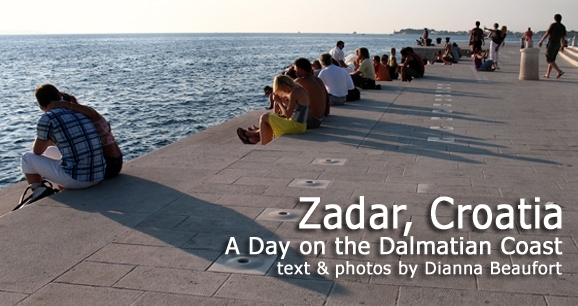 Today, Zadar is anything but a mess. The various layers of its history are cleaned up and distinctly visible. The main Forum square has proud Roman columns, a robust Romanesque church, Renaissance facades and a ’60s office building — the strictness of which is actually a perfect complement to the roundness of Romanesque Saint Donat. Terrace cafés serving maraschinos, a cherry liqueur produced in Zadar since the 16th century, provide great views onto the assembled architectural treasures. The stones of the monuments are like buttermilk, creamy in color with a translucent sheen. The creamy paving stones of the narrow streets are a welcome retreat in the heat of the Adriatic sun. In the 19th century Zadar became popular with the British upper classes who came to bask in the sunshine and build villas. They also discovered the Dalmatian dog and groomed it to their Kennel Club standards. Alfred Hitchcock visited often and it’s been claimed that the birds of Zadar inspired his film. There are indeed a lot of seagulls because historic Zadar is surrounded on three sides by water, with a footbridge connecting it to the mainland. With the exception of the Forum, most of the city’s squares are intimate and enclosed. The creamy paving stones of the narrow streets are a welcome retreat in the heat of the Adriatic sun. A huge defensive wall closes off the northern waterfront facing the mainland. Often, a line-up of cars waits to embark on the ferries to the many islands. In the last decade the city centre has been restored, including the southern waterfront, which received a special, contemporary upgrading. The city is a great mixture of historic details, such as the stylized stone pig peeking through the gap between the Cathedral of St. Anastasia and a neighboring palace. 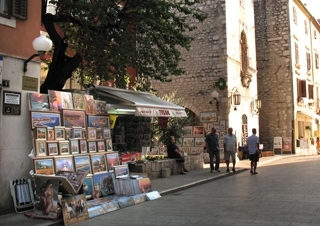 If there’s one commercial venture they’ve latched onto in Croatia, it’s selling art to tourists on the streets and in their beautiful old buildings. Modern art of an entirely different order is Nikola Basic’s landscape art on the seaside promenade. As I approached the end of the promenade I thought I was hearing a CD of New Age music—there were plenty of young students and alternatives to match the assumption. I then realized it was a non-stop symphony of the sea that never plays the same score twice. By constructing concrete shafts in the paving stones, Basic, along with expert stone carvers, created The Sea Organ, allowing the sea to make music. The movement of waves beneath the paving and the slither of wind that circulates between water and concrete create windy melodies, similar to a pan flute but deeper in timbre. 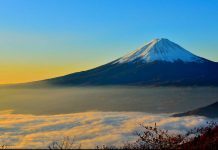 It is an incredibly impressive and wondrous thing. A seaside symphony is created by Nikola Basic’s landscape art on the promenade at sunset. Since its completion, the promenade has became the place to sit and hang out, either to swim or to lounge on the steps descending to water level. I watched the sun set into the hazy blue-green hills of the Adriatic islands while dangling my toes in the water for nearly an hour. Toward the evening it became increasingly busier with families and tourists and even, just before I left—you’re not going to believe it—a Dalmatian. Owned by an English couple.